Free Range Trophy Hunting in West Texas | Free range, fair chase trophy hunting in West Texas with internationally aclaimed professional hunting guide Rowdy McBride. 100% success rate on private land with 5-star accomodations. Through his years of quite persistence Rowdy Mcbride has built a reputation as an outstanding outfitter. I had heard this from many clients and friends. I tested this reputation on a hunt of my own and was not disappointed. He knows when to hunt them and the importance of good shooting and field techniques for success. I look forward to our next hunt together and recommend him when i have the opportunity. 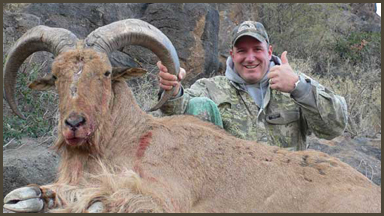 Rowdy McBride Hunting Services offers the largest amount of terrain in the highly sought after desert mountains of West Texas including the area's most productive private. Sportsmen from over the world come to West Texas for this exclusive experience, many of whom are repeat customers. Our hunts are conducted on-foot.